The small village of Thurstaston is located in the north west of the Wirral Peninsula. The name means "village of a man called Thorsteinn" and derives from the Old Norse personal name Thorsteinn and Old English tún " village". Thurstaston is thought to be one of the first places on the Wirral to be settled by the Vikings, The Viking parliament of Thingwall is located nearby. 'Turstanetone' is recorded in the Domesday Book as being held by Robert de Rodelent (or Rhuddlan), a cousin of Hugh, surnamed Lupus, but called by the Welsh 'The Fat', was created Earl of Chester and gave Thurstaston to Robert along with many other lands in the Wirral and as much as he could conquer in North Wales. 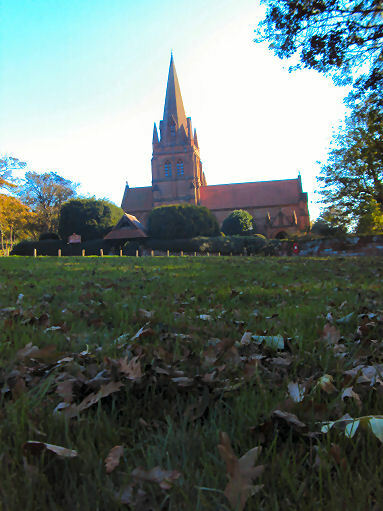 The red sandstone village church of St Bartholomew (pictured left) dates to 1824 and was designed by J. Loughborough Pearson R.A. . The earliest record of a Church occupying the site occurs around 1125 but other evidence suggests that one may have existed in Saxon times. The church contains an elaborately and finely sculpture alabaster reredos, representing the resurrection and the whole of the upper portion of the font is constructed of a solid piece of Mexican onyx, the pillars of Blue John stone and the base of three different kinds of marble. St. Bartholomew's has been designated by English Heritage as a Grade II listed building. The Old Church Tower is a remnant of Thurstaston's earlier church of 1824, the rest pulled down to prepare for the current church. Thurstaston Hall was constructed in 1350, although most of the current building dates from between 1680 and 1835. Samuel Bagshaw writing in 1850 describes the Hall as:- "An ancient structure with gables and bay windows, the seat of John B. Glegg Esq." The central block of Thurstaston Hall dates from around 1680, though the origins of a manor house here can be traced back to about 1070. The entrance might be older than the rest, possibly 1350. The Elizabethan-styled east wing was built in 1836, The west wing is 15th century or earlier.The entrance might be older than the rest, possibly dating 1350. Church Farm at Thursaston is a 60-acre organic farm and a great favourite with children, there are lots of animals to see, a play area and an animal trail with beautiful views over the River Dee and North Wales. The farm was the winner of the Family Friendly award at the Wirral Tourism Awards in 2010 and 2009. Thurstaston Common a popular spot with walkers for the superb views, at just 90m above sea level, it offers some of the best scenery the Wirral has to offer, from the summit of Thurstaston Hill the views encompass the Dee Estuary and the hills of Wales. Legend records that Thorstone Rock, a large sandstone mound, was thrown by the Norse God, Thor. The site is now jointly owned by Wirral Borough Council and The National Trust the site is managed by Wirral Rangers. Red Rocks Nature Reserve situated to the west of Hoylake and adjacent to the beautiful Dee Estuary and an important site for nature conservation on the Wirral Peninsula. Fort Perch Rock at New Brighton on the Wirral, is a coastal defence which was constructed built between 1825 and 1829. It was built to protect the Port of Liverpool and as a fortified lighthouse to replace the old Perch Rock Light. Hilbre Island the largest of three tidal islands which lie at the mouth of the Dee Estuary on the Wirral. All three, Little Eye, Middle Eye and Hilbre, have been designated a Local Nature Reserve maintained by Wirral Borough Council.